Top Glove continued to see selling pressure lately on concerns about weak demand, oversupply and persistent high latex prices. 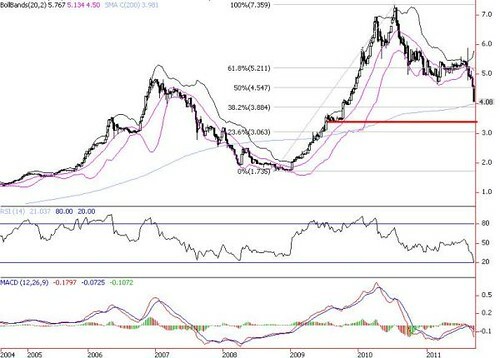 From the all time high at RM7.38 (16 Jul 2010), Top Glove had plunged 45% to close at RM4.08 yesterday, after violating the crucial horizontal support of RM4.70 (daily chart) and weekly lower Bollinger band (RM4.50). Overall, near term outlook for the sector remains dim as there were no strong catalysts to boost glove demand as well as profit margin, in the absence of pandemic and new markets. 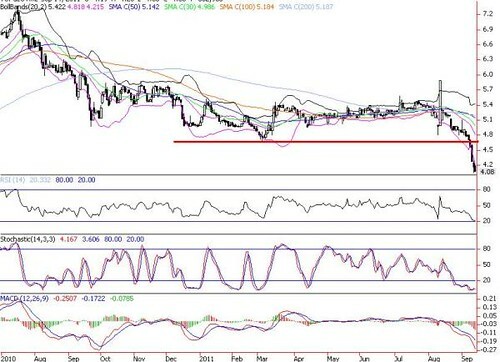 Despite its oversold indicators, we expect the trading band of RM4.36 (5-d SMA) to RM4.50 is likely to be a formidable resistance for any relief rally. More downside is in place if the weekly 200-d SMA of RM3.98 is broken.